The Reliance group strengthened its LYF brand of phones by launching its LYF WIND 4S mobile for a price tag of Rupees 7699. JIO is confident about the quality of the phone because it has announced that buyers of the WIND 4S mobile will enjoy 2 years warranty. JIO group has aggressively launched 4G mobiles for a price starting at Rs 3600 to 19999 Rs. Because of this strategy, JIO has emerged as a successful player in markets. Not sure about who is managing the LYF brand of mobiles, but RJIO is faring quite well. One thing that helped the LYF brand survive is the JIO welcome offer that provides data benefits free of cost for 90 days. The new VoLTE phone is not as enticing as Redmi 3S, Moto E3, but the welcome offer, large 4000 mAh battery, and warranty make it worth the money. The enormous battery size will make data hungry users will love the WIND 4S phone. Once the user charges the battery, he can use the device for up to 24 hours. RJIO phones come pre-installed with JIO music and video streaming apps. According to JIO, the WIND 4S offers up to 11 hours of video playback at HD resolution and 41 hours of music playback. One thing to note down is that the mobile packs an SD 210 quad-core SoC, which offers Qualcomm quick-charge support. Hence, the 4000 mAH capacity battery won’t take 4 to 5 hours to charge. The processor of JIO LYF WIND 4S clocks at 1301 MHz. It uses lithium-polymer materials. 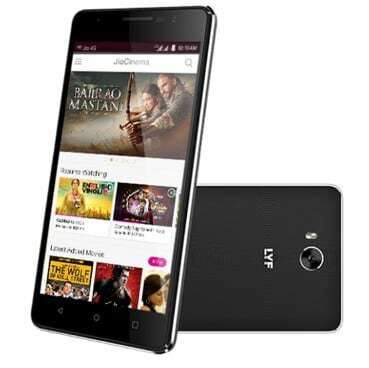 The Reliance JIO phone has an IPS 5.0 inches LCD screen with 292 pixels density and 720 pixels resolution. The LYF WIND 4S smartphone provides HD back camera which supports 30 FPS/720p video recording with its 8 MP sensor. It supports six times zoom and offers a 5MP selfie camera without flash. The 4G mobile supports Microsoft Exchange. It is 8.99 millimeters thin and has 147 grams weight. It packs 400 MHz Adreno 304 GPU and runs Android 5.1 OS. The LYF WIND 4S phone ships with four sensors (including e-compass). It supports USB OTG function, with which you can connect a pen drive to the phone. LW4S has 16GB ROM. It has two SIM card slots (Standard+MicroSIM). WIND 4S supports 12GB MicroSD cards and five-fingers multi-touch functionality. It has a metal frame and curved edges. It has a gesture function that allows you to open apps by drawing specific patterns on the screen. The mobile comes with DTS speakers. You can buy it from the Reliance Digital Stores in India for below Rupees 8000. Use Android navigation app such as Google Maps to find the nearest store. Next articleWindows 10 vs Linux Mint 18 : Which OS is better?